NOTE: ATTENDANCE FOR THIS EVENT WILL LIKELY REACH OUR MAXIMUM OF 50 PEOPLE, SO SEATING WILL BE AVAILABLE ON A FIRST-COME, FIRST-SERVED BASIS. Tana invent the quartet of the twenty-first century. The are audacious, pioneers and precursors. Tana foresee the new sounds of the modern string quartet. 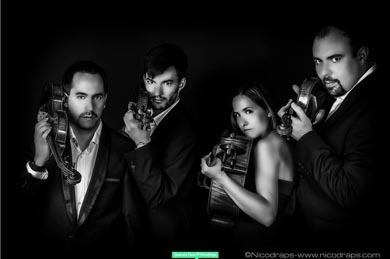 Following the success of their debut recording, the complete string quartet music of French composer Jacques Lenot for the Intrada label, the Quartet continued their eclectic discography with an album devoted to saturated music by Bedrossian, Cendo and Robin, Shadows, released in January 2016, which precedes a second volume for Paraty dedicated to electronic music "VOLTS" available on the 09/09/2017. In the meantime, the quartet has released the complete works for string quartet by Steve Reich for the MegaDisc Classic label, acclaimed by press, receiving CHOC Classica september 2016.